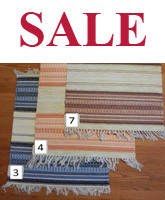 Returned special order items are subject to a restocking fee of 20% of the purchased rug price plus return postage. Our amazing vinyl plastic Swedish rugs from Sweden are known to last 20 years or more. They are woven on power looms with narrow vinyl strips of plastic sheeting. The warp is a blend of nylon and cotton, which gives the rug strength and durability.